Rockstar Games has announced the next major update for Grand Theft Auto V's multiplayer mode. "Gunrunning" is a "massive" expansion for GTA Online that is slated to launch in June. The developer did not share much in the way of specifics about Gunrunning, but as its name suggests, it will involve the illegal weapons trafficking industry. It builds on the previously released Executives & Other Criminals and Bikers updates, with an eye on criminal activity. "While sharply dressed CEOs trade Special Cargo from lavish air conditioned suites, and leather-clad Bikers own the roadways moving illicit consumer goods," Rockstar said. "New opportunities are opening in a highly lucrative and equally malicious network hidden underground ripe for takeover by the VIPs, CEOs, and Biker bosses of Los Santos and Blaine County." In Blaine County, there will be "hatches" available to players. These are "mysterious properties" that can be acquired to stock with "military-grade vehicles and weapons manufacturing equipment." Players can earn "top dollar" for participating in weapons trafficking. Rockstar will announce more details on Gunrunning, including all of its new weapons, upgrades, and vehicles in the time ahead. An amphibious vehicle called the APC is one of the new vehicles, while the Tampa gets a weaponized upgrade. 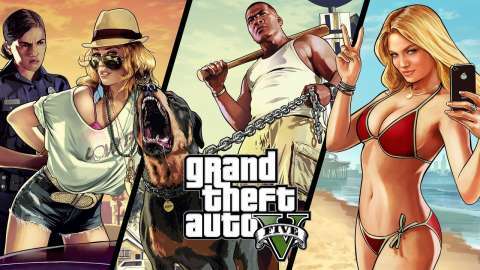 In other GTA V news, the open-world game has now passed 80 million copies shipped. ColdWhim, sirprize10, Enigma and 1 other person like this.